SNOW in the forecast this week! Book now for some great winter fun! Summer’s long gone but that’s no reason to fret. 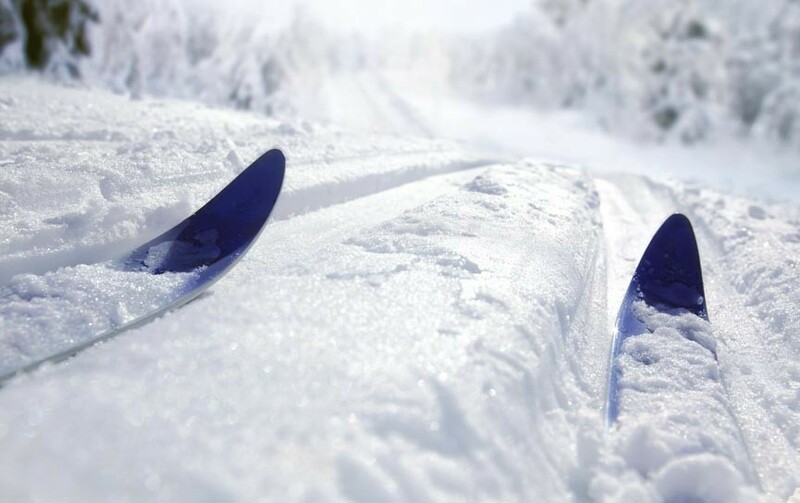 Freeport skiing and snowshoeing opportunities are many so, when old man winter comes calling, the only thing to do is grab your coat, hat and mittens and join in! Ah, winter. Summer gets more of the press and longing but who among us who have experienced a good day on skis, snowshoes, or a sled hasn’t enjoyed the activity as much, if not more, than a hot day under the sun? Plus, there’s the coming back in to warm yourself by the fire with a mug of hot cocoa to look forward to! While Freeport’s location on the Maine coast puts us a bit out of the way for any of the nearest alpine ski centers, the L.L.Bean flagship store and campus call us home, so you know there are plenty of local areas and support for cross-country skiing, snowshoeing, and sledding. Winslow Park – in Freeport! A nice, local resource with ocean view trails allowing both cross country skiing and snowshoeing. Be sure to ask us about other local trails, like the Cousins River Trails. Wolfe’s Neck Woods State Park has 4.5 miles of trails through the woods and along the rocky shores of Casco Bay and the Harraseeket River. The trails are not groomed but the wooded trails, especially the Old Woods Trail and the uncleared park access road, make for some prime snowshoeing and Nordic skiing. Bradbury Mountain has over 5 miles of trails for cross-country skiing, snowshoeing, and snowmobiling. In fact, it’s the only state park in southern Maine to offer shared-use trails for horseback riders, mountain bikers, and snowmobilers. Snowshoe rentals are available. Pineland Farms has over 5,000 acres of beautiful woodlands and fields open to the public for various outdoor activities, including almost 30 kilometers of professionally designed, well-kept trails, 2 warming huts, and ski and snowshoe rentals. There are also areas for sledding and ice-skating. Offering 25 kilometers of machine-groomed trails, a warming hut, and ski and snowshoe equipment rentals, Smiling Hill Farm is another popular, large cross-country ski center. Lost Valley Ski Resort in Auburn features not just equipment rentals and 12 kilometers of cross country skiing trails but also a small downhill ski area and a terrain park for snowboarders. No snowshoeing, however. Also, if you’re a first timer or looking for a guided experience, be sure to check out the L.L.Bean Outdoor Discovery School. Expert instructors will guide you in the basic skills and provide you with the equipment you need to enjoy skiing, snowshoeing, and more. Brewster House Bed & Breakfast is ready to host your Maine Coast getaway no matter the season. We have the local knowledge to help direct you in your Freeport skiing and snowshoeing activities as well as the gourmet breakfast to get you going in the morning and the fireplaces, hot cocoa, and wine cellar to soothe and warm you on your return! Book your stay at Brewster House Bed & Breakfast, now!